The most important question in ASO (app store optimization) is which keywords to choose. At first, it may seem simple – you just have to look at statistics. What is more difficult though is where to look. Although many newbies choose a keyword on the basis of how many searches it gets, you wouldn’t want to choose this path. In fact, what really matters is relevance and competition. The first feature means that you should choose keywords that are relevant to your app and specific or characteristic for your niche instead of general and popular ones. Ask yourself how likely someone who searches for this keyword would download your app. If the answer is ‘very’, go for it. Secondly, think about competition. Even if a keyword gets a million searches every week, ranking as #544 app for it won’t bring you any closer to boosting its discovery. Look for keywords that can get you to the top 10 results. If you’re not sure which keywords to choose, have a look at these app store optimization tools to find the right keywords for everything from your keyword list to app name. Good examples are MobileDevHQ, AppTweak, Appcodes, or App Annie. There are two reasons why the name of your app is extremely important. To begin with, the first thing users will see after your icon is your app name. That’s why you need to make sure that the name of your app instantly communicates what it’s about. You should also include some keywords which tell what the app does to make your product relevant and grab users’ attention. The second reason is even more important: the words you put in the app name will act as keywords the same way as a keyword list. They’re even more important than the actual keywords. That’s why your name needs to be balanced between keywords and branding. How a profile of an app looks like in the Apple App Store and what users can see? 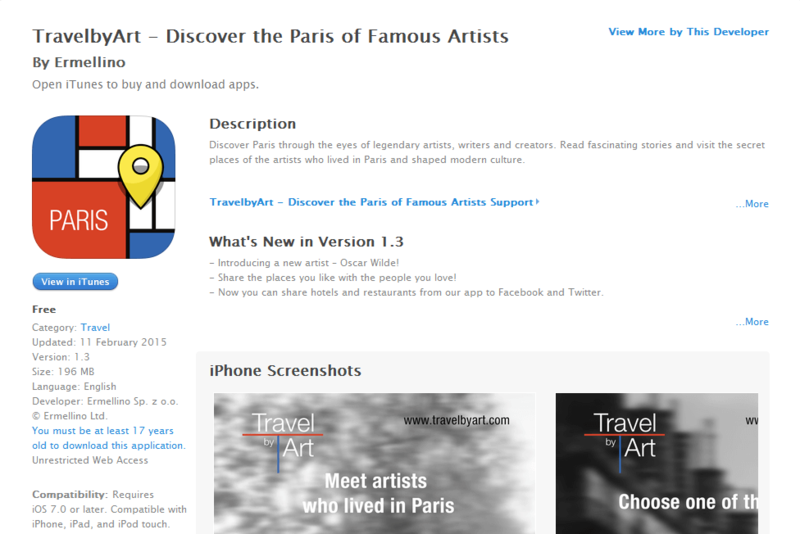 An example of our app TravelbyArt. In the Apple App Store you have the possibility to list your keywords. The number of characters you can use is restricted though. That’s why you should consider using digits for numbers, not their names. If you’d like to use “9” for example, make sure you use the digit, not the name “nine”. Why to do so? The reason is quite simple – for a search term “9”, the Apple App Store will look for both “9” and “nine”. By using digits though, you use less precious characters and the extra space can be enough to add another relevant keyword. Another tip is not to repeat the words. Let’s say you’re aiming for key phrases like “effective dog training” and “easy dog commands”, you don’t need to repeat the keyword “dog”. Your keyword list should look like this: effective, easy, dog, training, commands. Don’t repeat words in the app name either. If your app is called “Dog Training”, you don’t need to repeat the words “dog” and “training” in your keyword list. This smart move leaves you room for adding more relevant keywords. If you can replace a longer keyword with two shorter keywords, go for it. This way you’ll have more possible search results to rank for. The more keywords you add, the greater the number of key phrases to choose from. Still, relevance should be your priority, not word length. If you come up with two equally relevant keywords, use length as a tiebreaker. Don’t use spaces to separate words. It reduces the number of characters available to you for keywords. The Apple App Store algorithm sees spaces and commas as separators. So when filling your Keywords field, don’t write “dog, training, effective, tips” but “dog,training,effective,tips”. Use these 6 tips for your Apple App Store optimization and you’ll be on your way to appearing higher in search result ranks and attracting more users to download your app. Are you curious how to promote your mobile app? Our expert ebook will help you to boost your app downloads! Check it out. Choosing keywords is a critical step when crafting a marketing strategy for your iOS app. App stores’ search engines are an important channel of discovery so choosing the right keywords practically guarantees more exposure and a greater number of downloads. In this post, we cover 6 essential tips to help you ace Apple App Store keyword optimization. HOW ARE MOBILE APPS CHANGING THE WAY WE DO SPORTS? HOW TO MAKE MONEY WITH IN-APP PURCHASES?